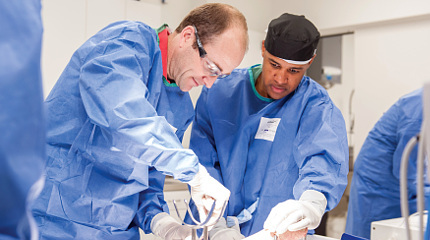 Arthrex Surgical Skills Training Centers: The Arthrex commitment to education features a surgical skills training facility located at our headquarters in Naples, Florida, welcoming surgeons to participate in a unique, intimate, and practical lab experience instructed by today’s leading orthopaedic surgeons. Additional Arthrex Surgical Skills Training Centers are located in Scottsdale, AZ; Los Angeles, CA; New York, NY; Irvine, CA; and Vail, CO. Each Surgical Skills Training Center is equipped with the latest arthroscopic wet and dry lab simulators and is stocked with a complete inventory of the latest instrumentation and implants. Fargo, North Dakota in-house lab coming soon! RSW Medical, Inc. currently offers two in-house surgical skills training labs within our territory – Dakota Dunes, South Dakota & Omaha, Nebraska. Both sites are equipped with the latest arthroscopic wet and dry lab stations and are stocked with a complete inventory of the latest instrumentation and implants. Our Mobile Learning Center is accessible to all facilities throughout our territory for on-site education and surgeon training at a time and place that fits into busy schedules. Equipped with 2 lab stations, the state-of-the-art mobile lab is prepared to advance your entire surgical team to new levels in surgical performance and efficiency.